The Post-earthquake reconstruction/demonstration project of Guangming Village, designed by The Chinese University of Hong Kong, was declared the World Building of the Year 2017 at the tenth annual World Architecture Festival, held in Berlin. Following the magnitude 6.1 Ludian earthquake on 3 August, 2014, 90% of the local buildings in Guangming were destroyed. This project reinvented the traditional building technology, providing villagers with a safe, economical, comfortable, and sustainable reconstruction strategy that they could afford, own, and pass on to their children. The judges believed this to be an extraordinary project in terms of the scope of ambition, exemplified in the addressing of profound problems facing ordinary people. They applauded the re-use of traditional materials and construction methods but with the addition of new technology – combining ancient wisdom with modern know-how. The judges were also impressed by the iterative research process which could be re-applied to anywhere in the world affected by seismic problems and low levels of wealth. This project aimed to innovate the traditional rammed-earth building technology. This scientific and systematic reconstruction strategy and craftsmen training program also provided guidance for national reconstruction policies and rammed-earth building standards in the future. The traditional rammed-earth technology was improved with the “high science and low technology” strategy, which mainly focuses on seismic capacity, thermal comfort, and cost efficiency. Various seismic strategies implemented included components of the wall being adjusted using clay, sand, grass, and cement to make the wall solid and stable. Steel bars and concrete belts were added to the wall to improve structural integrity and to avoid vertical cracking. Electrical rammed tools with improved, stronger heads were used instead of manpower to improve the intensity of the wall and aluminium alloy formwork was used instead of wooded formwork. A shaking table test was conducted to validate the seismic performance of these innovations and results showed significant improvement in the seismic performance of the rammed-earth building and that it could meet the local seismic codes. A prototype house was built for an aged couple who lived in a tent after the earthquake to validate the performance of the innovative rammed-earth building system, and provide craftsmen training for the local residents. The quality of building materials has increased. Doubleglazed windows and insulated roof are used to improve the thermal performance of the building. Rammed-earth construction has a long history in China, particularly in rural areas. Mud was the main material used in traditional architecture as it is inexpensive, is accessible, and exhibits impressive thermal performance. On-site measurements showed that the thermal performance of the rammed-earth house is better than that of local conventional brick– concrete houses and the construction costs cheaper. Many local government officers and local residents now favour this type of house. Local residents are becoming skilful construction craftsmen and villagers can also utilise this technology as a means of increasing their incomes. Local residents have been fully engaged in the entire process of reconstruction. Their knowledge of local technology and local culture has significantly improved. Multidisciplinary university resources are being fully used to support rural reconstruction. University students and local government officers are also involved in learning and practicing this new sustainable method of rural reconstruction. 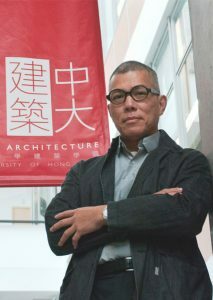 Chinese University of Hong Kong (CUHK), Professor of Architecture, Edward Ng, is very excited about the award. He believes this is recognition of CUHK’s architecture department’s commitment to the innovative use of traditional building materials. He also notes that recognition from international awards can also enhance the acceptance of traditional buildings by local governments. Ng explained the concept of “high-science and low-tech” means that housing in earthquake-prone areas needs careful scientific research and rigorous treatment before suitable housing can be designed for the area. However, since villagers simply do not have modern and advanced technology to deal with housing construction, it needs to be done simply and in accordance with locally available materials. 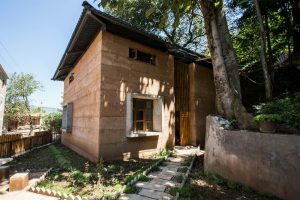 With sensitive assessment of building materials, techniques and design, this reconstruction project has proven that rammed earth houses are economical and practical, warm in winter and cool in summer, can meet the local seismic codes of fortification intensity 8. 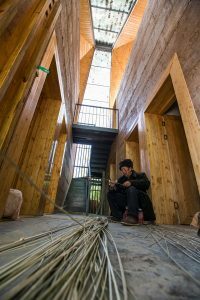 “With this project local traditional rammed-earth construction methods and lifestyle are protected by improving its building performance with a simple strategy and local materials,” he said. Prior to this project, from 2005, Professor Ng’s team have completed ‘A Bridge Too Far’, ‘A School to Learn’, ‘Maosi Ecological Demonstration Primary School’, and ‘Wu Zhi Qiao’ bridge projects and post-earthquake village reconstruction demonstration projects. The CUHK team hope that, at a subsequent stage, this anti-seismic earth building system will be applied to more rural projects in southwest China. This strategy will also provide guidance for local reconstruction policies and rammed-earth building standards.